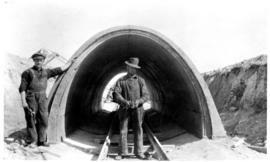 A photograph of the building of the Shoal Lake Aqueduct. Officially opened on September 9, 1919. Item appears to be a photographic reproduction of an image dated June 24, 1915. A photograph showing the construction of the aqueduct, built by the Greater Winnipeg Water District to supply water to the greater Winnipeg area. Completed in 1919, the aqueduct carries water from Shoal Lake. Photograph taken on November 4, 1915. A photograph showing the construction of the aqueduct, built by the Greater Winnipeg Water District to supply water to the greater Winnipeg area. Completed in 1919, the aqueduct carries water from Shoal Lake. Photograph is dated November 4, 1915. Contract 31 - Mile 43 - Chief Engineer in Arch. A photograph showing the construction of the aqueduct, built by the Greater Winnipeg Water District to supply water to the greater Winnipeg area. Completed in 1919, the aqueduct carries water from Shoal Lake. Photograph is dated August 31, 1915. A photograph showing the construction of the aqueduct, built by the Greater Winnipeg Water District to supply water to the greater Winnipeg area. Completed in 1919, the aqueduct carries water from Shoal Lake. Photograph taken on August 30, 1915.